Be the first to share your favorite memory, photo or story of Mary Joan "Jo". This memorial page is dedicated for family, friends and future generations to celebrate the life of their loved one. 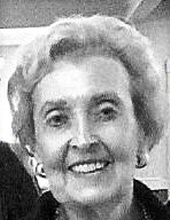 DALLAS-Mary Joan “Jo” Sinclair, 87, of Dallas died Monday, November 19, 2018, in Dallas, in the Pickens Hospice and Palliative Care Center following several years struggle with Alzheimer’s Disease. Born March 20, 1931 in Rockville, Indiana, the daughter of the late Issac Ferguson and Florence Margery Rogers Sinclair. Joan will be fondly remembered by her cousin, Mrs. Audrey Biggs of Peoria, AZ. Joan was a graduate of Rockville High School, and Indiana State University with a BS in Education. Jo began her 43 year career with American Airlines as a stewardess trainee at Midway Field, Chicago in 1952. She lived in New York, NY prior to moving to Dallas with the opening of DFW, and the Corporate move of American. Joan previously held management positions with American in Flight Service training, Domestic and International Operations, and in Food Service with Sky Chefs. Joan retired in 1995 as Chief Skipper/Manager of the Admirals Club in Terminal 2E in the DFW Int’l Airport. Joan will be remembered for her independence, her loyalty to friends, and her love for American Airlines. Services will be 3:00 pm Saturday, November 24, at Gooch Funeral Home, 112 W. Howard Street, Rockville with Pastor Greg Goodrick officiating. Burial will follow in Memory Garden Cemetery. Visitation is from 1-3 pm Saturday at Gooch Funeral Home. In memory of Joan and In lieu of flowers please consider a donation to the Dallas Chapter of the Alzheimer’s Association of America at 3001 Knox Street, Dallas, Texas 75205. To send flowers or a remembrance gift to the family of Mary Joan "Jo" Sinclair, please visit our Tribute Store. "Email Address" would like to share the life celebration of Mary Joan "Jo" Sinclair. Click on the "link" to go to share a favorite memory or leave a condolence message for the family. memory of Mary Joan "Jo"